I'm so proud of him and have decided that despite his faults he can stay. He loves catching mice! In fact, he growled at my daughter when she tried to take one away from him. I had my doubts about him because he ignored the mouse my son pointed out to him last year. I guess he was just too young then because he's definitely not ignoring them now. This week I worked on Dragon Skies and Fairy Dreams by Lavender and Lace. I think the last time I worked on that was in 2004! Once again, I spent some extra time on Dragon Skies and was sad to put her away. I'm already looking forward to the next time I get to work on her -- I hope to get that top part of the dragon done. 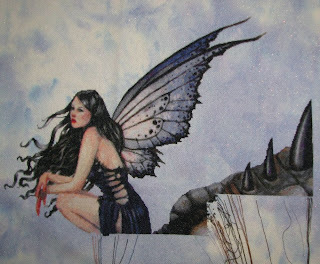 On the flip side, I'm afraid I only worked on Fairy Dreams for two days. 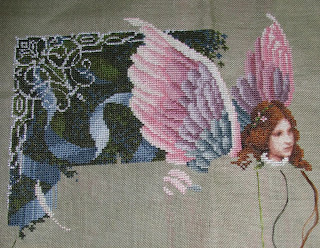 That was primarily because I got my supplies for Chatelaine's Peacock Garden from European Cross Stitch and can't wait to get started on it. And unfortunately my OCD won't allow me to skip forward in my rotation! But I can truncate it a little bit. Despite that, I did find that I enjoyed working on Fairy Dreams. I just love the colors! 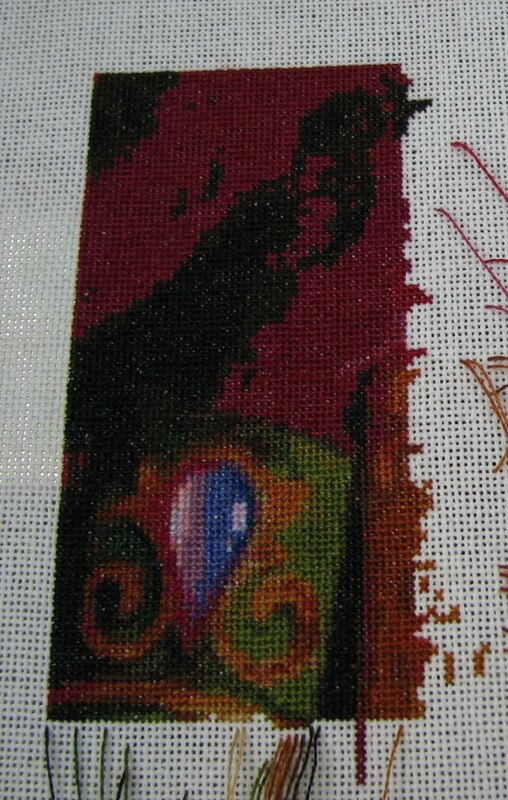 I did forget to backstitch her face, though, and am considering leaving it that way. 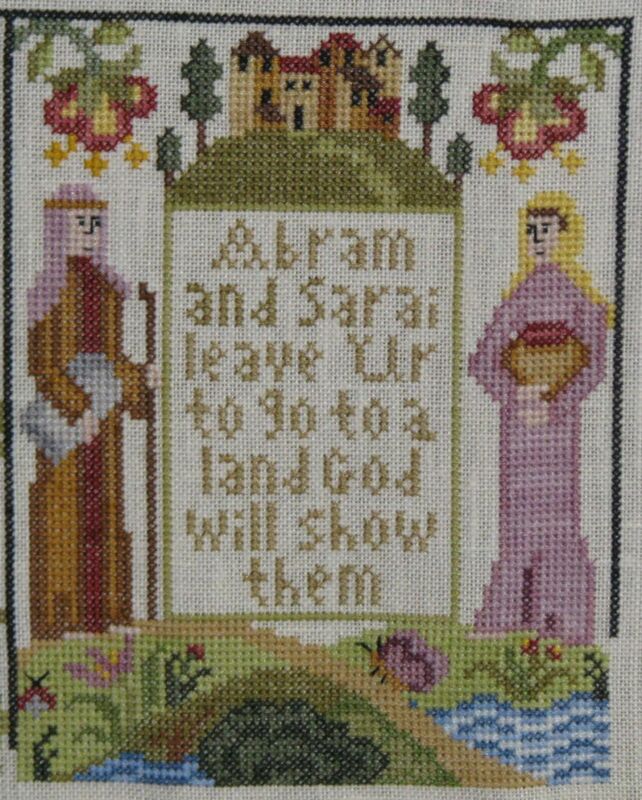 I think all the HAEDs I do have shown me that the backstitch isn't always necessary and I think her face is quite clear without it. Who knows, though? It will probably be years before I pick this one up again and my opinions may have changed completely by then! Instead I have a finish! 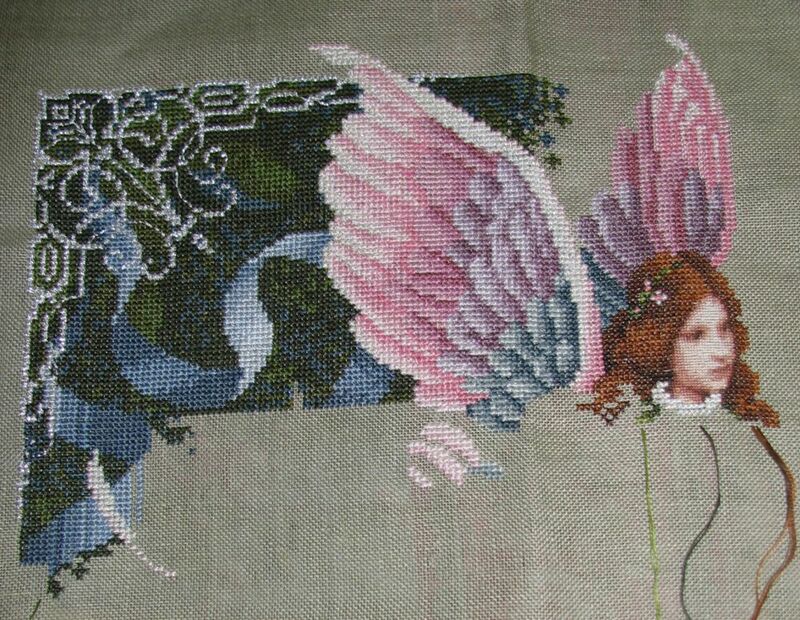 Day Dreaming Mermaid was completed on September 12, 2010. She was a birthday present to myself and I started her on November 28, 2007. She was included in all my different rotation variations and I worked on her on 8 times for a total of 49 days. Also included this week is Days of Advent Sampler. I had more trouble with colors and decided to switch back to the NPI for the browns as well as all the greens. These colors had more than one "group" (3 for the greens and 2 for the browns) and it was too hard getting the separate groups to flow together nicely using Hand Dyed Fibers. I did torture myself over it, but in the end it was just not worth the trouble. 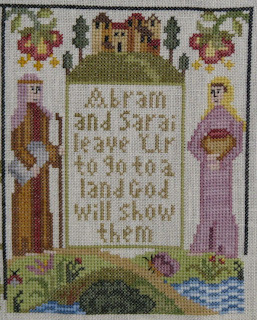 Here is a separate picture of the Abram and Sarai block that I completed this time. It's too bad about the HDF since I particularly like the subtle variegation you can see in Sarai's dress. I would have liked to have that in the large blocks of green as well, but them's the breaks. I enjoy working on this one so much and was dismayed to see that the last time it had come up was in December. Almost a year!! So I have decided to change it's status to "Priority" and bump Rose down to "Favorite". My baby went back to school today. And she's not really my baby any more */sigh/*. And today is the last day of my vacation */even bigger sigh/*. 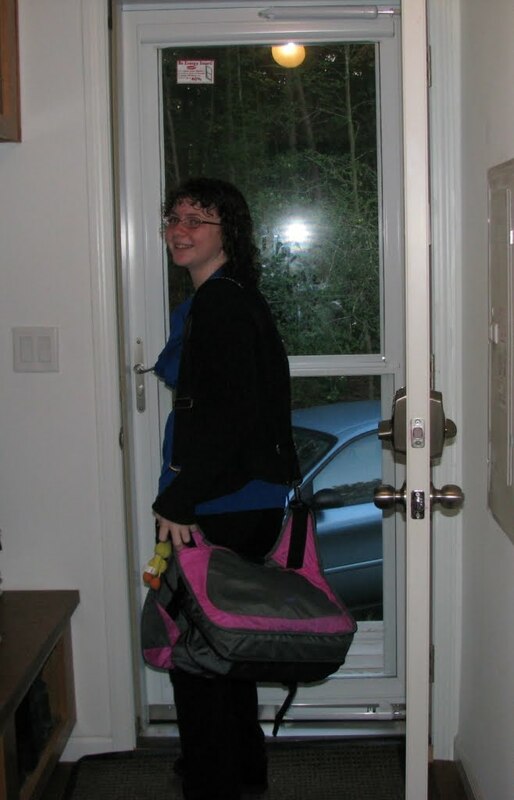 This was my stay-at-home-and-relax vacation. We didn't do much -- spent a day at the beach and another school shopping and a movie. We also went down to the ocean on Friday. I've always wanted to watch a hurricane blow in, or in this case by, so I decided to brave the holiday traffic. It was pretty cool and I wish now that I'd taken the camera. I also wish I'd forced Randi to wear shorts. We got caught in a bad spot when a big wave rolled all the way up into the dunes and she ended up with extremely wet jeans. The bottom of my shorts got a soaking as well, but that was much easier to shrug off. So I succumbed to her pleading and we got off the beach. And now for the cross stitch updates. First is Calling the Crows. I absolutely love this image and wish the design wasn't so huge! All I have to show at this point is three wing tips. I really like how the background is looking so far though, the colors are blended together so nicely. 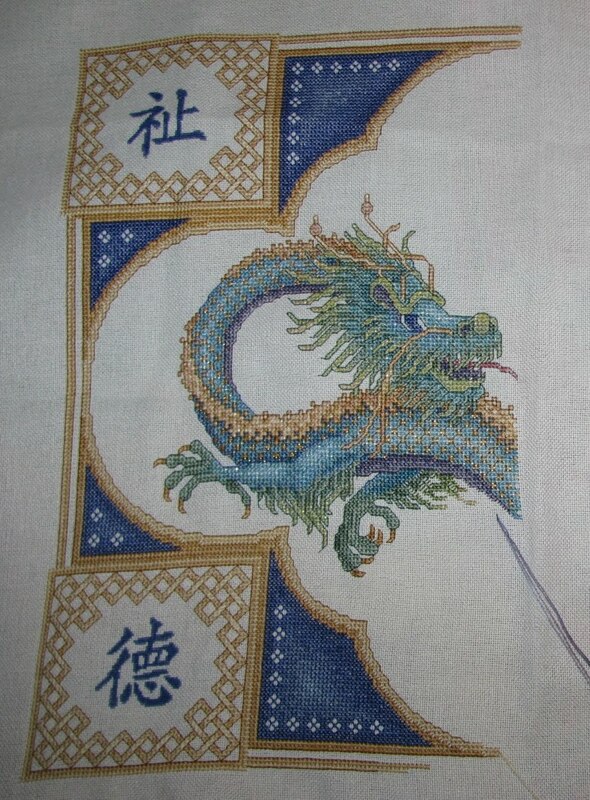 Next is Celestial Dragon. I completed the bottom left corner. 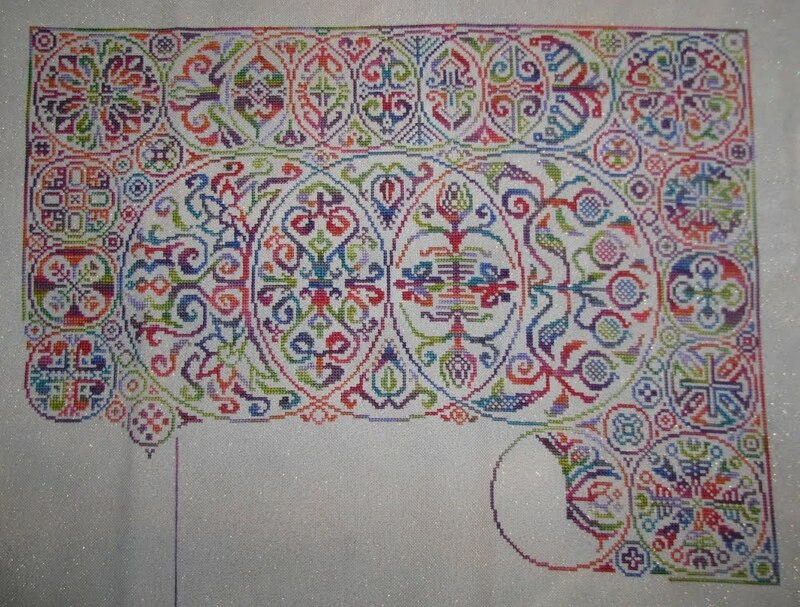 The knotwork looks lovely, but it surely is a pain to stitch! Then I worked on Cirque des Cercles. And completed the bottom right corner. Just the bottom row of circles to go! And finally, I started Curl Up With a Good Book. 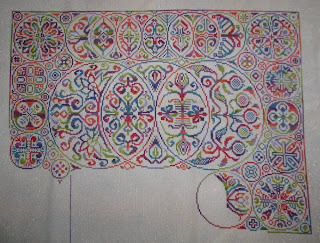 I tried out a new technique with this one and stitched by columns. I don't know if I'll keep with it, though. I think I may have gotten more done than usual -- 5 columns of 98 stitches each (4900) in 4 days plus about 3 hours. And I like having a larger chunk of the image done, rather than narrow bands. On the down side, I lean toward carrying threads and this way may not be as conducive to that. I carried some pretty far! Also I was working from four separate pages since I need to have it blown up. Since I work with my chart to the right of my stitching, I'm going to run out of room for all those pages pretty quickly.